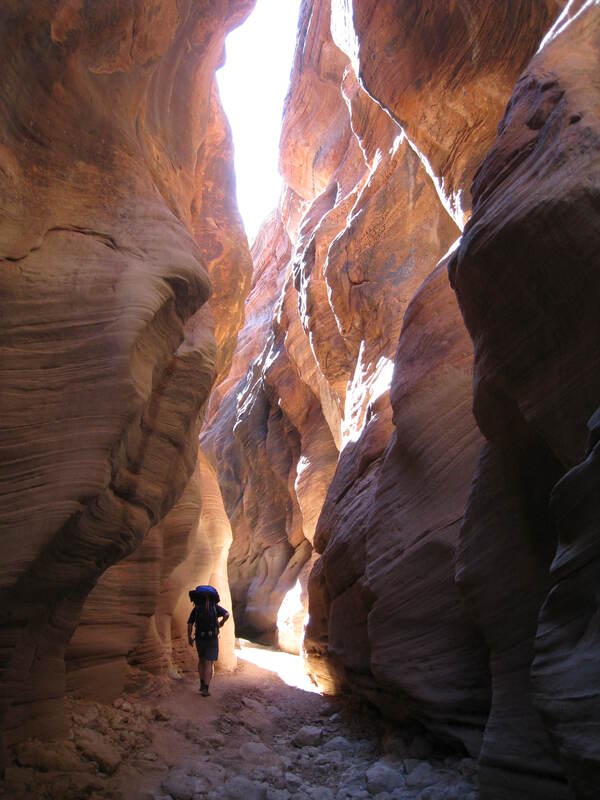 The hike down Buckskin Gulch into and on down the Paria river canyon to the Colorado river at Lee’s Ferry is maybe the most amazing walk I have ever done and it is on many lists of the top hikes in the world. This trip has been in the making for years. 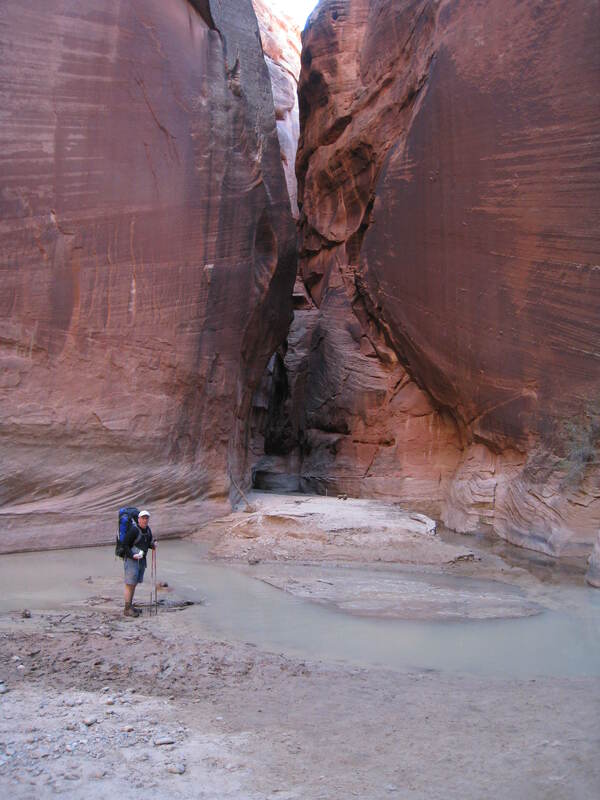 I went to college in Utah and had many wonderful hikes there but the Paria river had never been on the radar screen until 2001 when on another trip to the area I picked up some information on the hike. I began to hatch a plan to walk it for my 50th birthday year so in October of 2006 I gathered together 9 other family members and friends to share the experience with me. After nearly a year of planning and organizing all these people we flew into Las Vegas, rented cars and drove to the trips end point at Lee’s Ferry. Next day we paid a shuttle service to carry us to the trailhead and we were off. Two hours into the hike the Coconino County Arizona Sheriff’s department rescue helicopter landed in front of us in the 75 foot wide canyon and told us everyone had to get out of the canyon, high danger of flashflood. The trip was over. This was the redo trip. 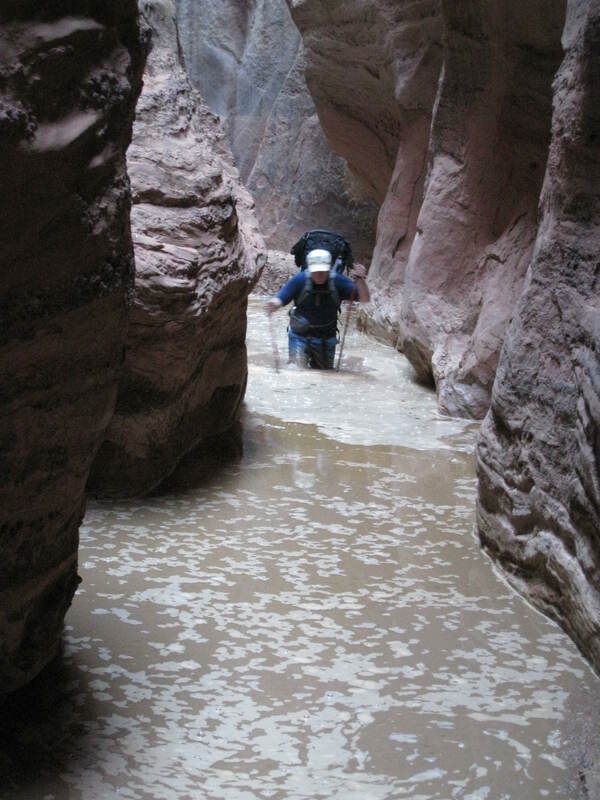 Turned out that October of 2006 was one of the wettest on record in southern Utah and this is definitely a place you don’t want to be in, in a flash flood! Due to it’s narrow and sensitive riparian area and popularity they only allow 20 people a day into the area who plan to camp overnight. Permits are available online up to four months in advance, during the most popular times (May, June, October) they will sell out in minutes. The permit system works well from what I can see, so well we saw no one else for 6 days. 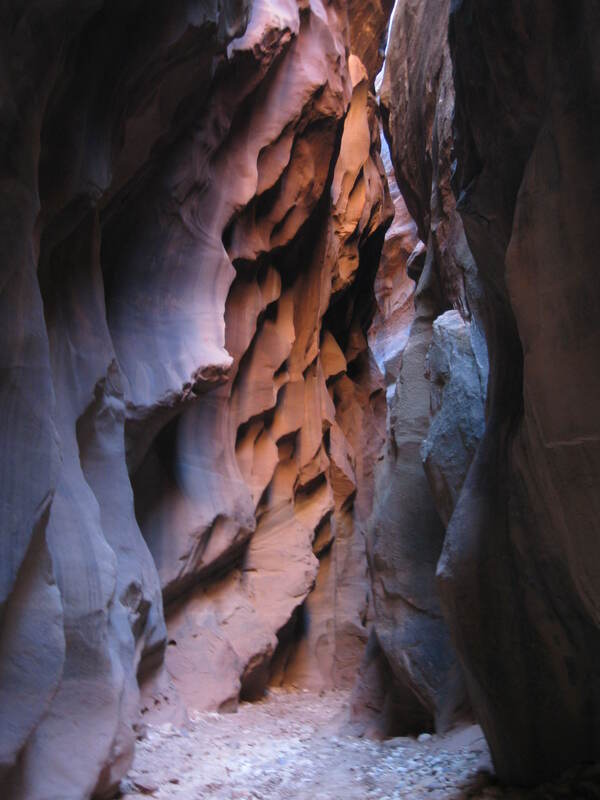 Here is the official Paria canyon website. As I walked down this amazing place I began to realize what an untamed/active environment it is. It literally changes with every flood, there is no established path for the first 30 miles as it is washed away each time. It is in some ways a very easy trip, down hill all the way with an easy gentle drop (it drops 2000’ in 44 miles) and good water availability for the desert. In other ways it is very difficult, as you will see, with a few crux’s along the way. It is also difficult to plan for as it is shady, cold and wet for the first half and sunny, hot and drier for the second half. November in southern Utah can begin to get chilly but this fall had been warmer than normal and we had temperatures at least 5 degrees warmer than usual and crystal clear skies. The river had flooded in mid August and again big in mid September (the river gages went up and down 5 feet over night!) six weeks before we went in. 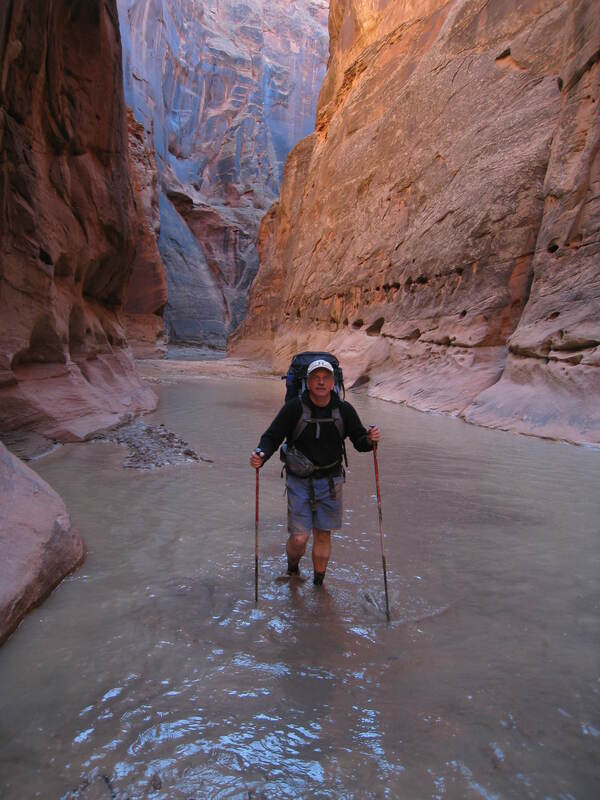 The few recent reports that I could find indicated waist deep wading in pools the first day, deep satanic mud near the confluence of Buckskin Gulch and the Paria river, and a chest deep pool/wade on the third day. This time I went in with just one person, Scott. We flew into Las Vegas and 5 hours later were at Lee’s Ferry. We stayed at Cliff Dwellers Lodge again and had a quiet evening packing up. The next morning we met our shuttle (Steve Dodson from Paria Outpost and Outfitters), stopped at the Paria ranger station on the way to the trailhead to check in and get our human waste bags (yes you have to carry out your poop) and got to the Wire Pass trailhead at 10:00. No turning back now. 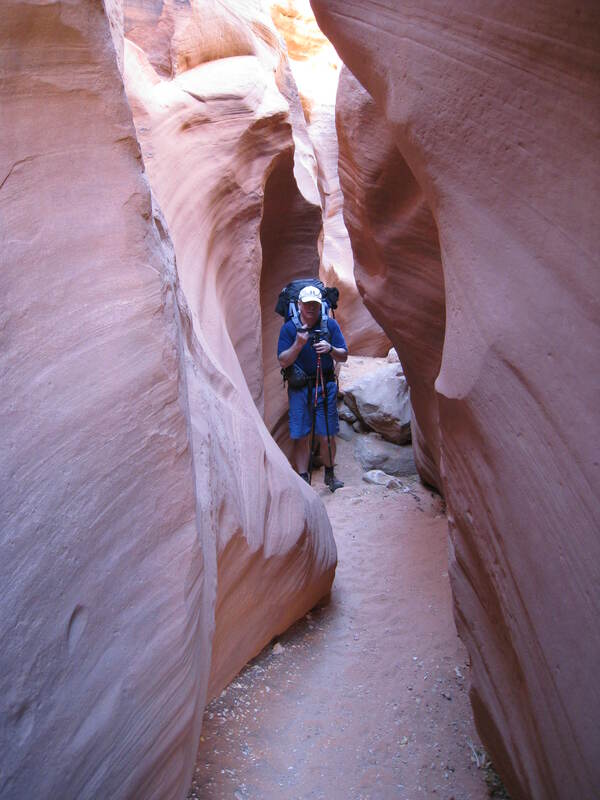 You walk for about a half an hour down an open wash and then all of a sudden it begins to drop down into the sandstone and you are beginning 14 miles of the longest slot canyon in the world! 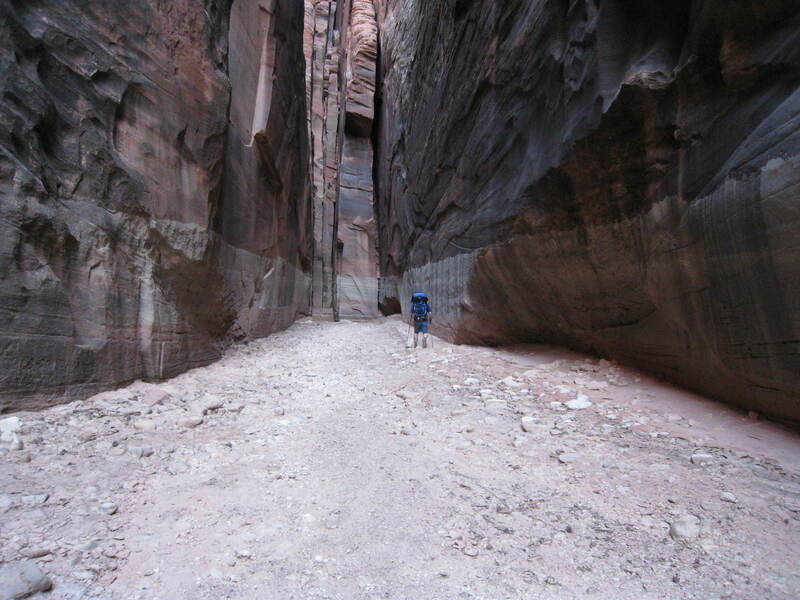 Wire Pass is the most common upper entrance and it is the narrowest portion of the canyon with a sandy bottom. 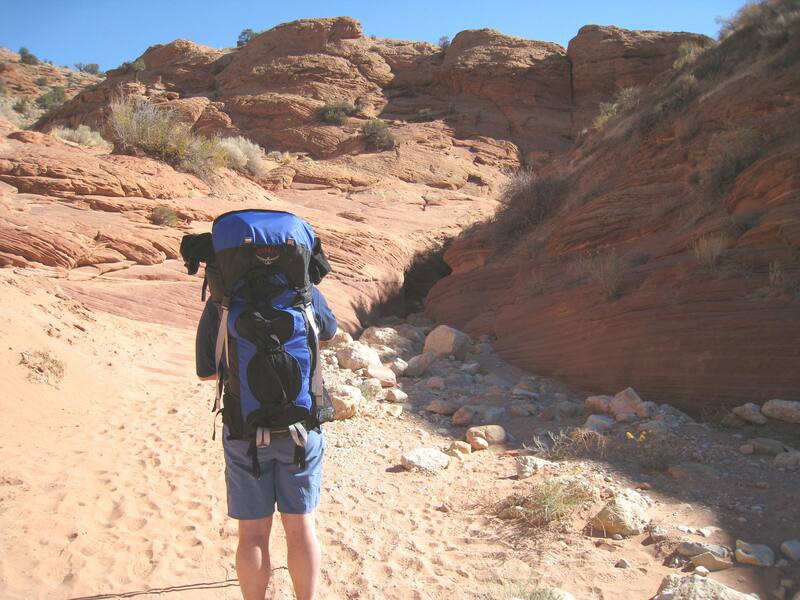 So narrow I had to take my pack off at one point and wore holes in my pack side pockets from brushing against the sandstone. 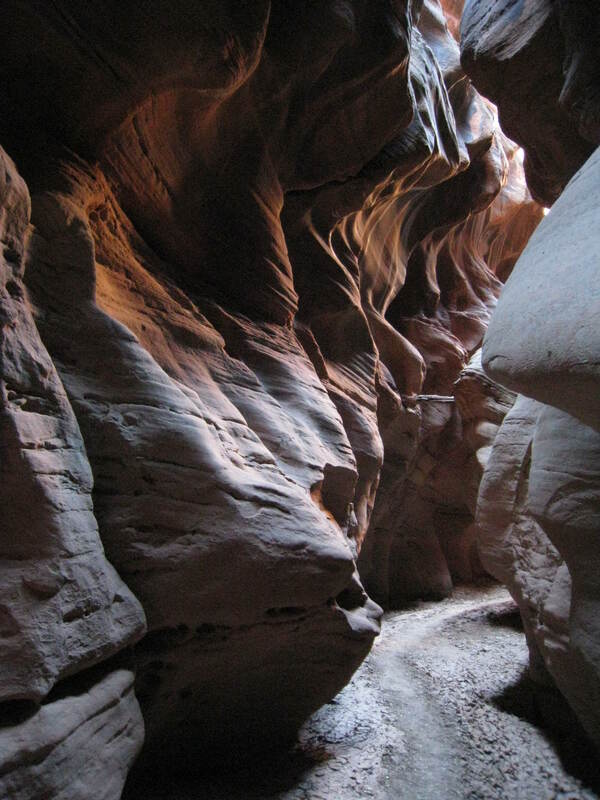 The whole place is otherworldly but upper Buckskin especially so with it’s swirling carved passages and with only a few places more than 10 feet wide. In some places it is so convoluted and dark it is like caving with the walls up to 100 feet high. I can tell you right now that photography is a challenge with the strong light contrast, I did the best I could with a point and shoot. At places it looked like the canyon just dead ended but would take a 90 degree turn, notice how high the mud line is from the last flash flood. About an hour and half in we hit the first muddy pool we couldn’t get around but it was near the end of the day when we waded through 22 pools in quick succession. Cold and dirty water with sticky and stinky mud but only a few crotch deep, woohoo!! We arrived at the point in the canyon where a scrambling/climbing route into the canyon enters, called the Middle trail (about 8 miles). It would be an uncomfortable way to get in and out but it is doable. 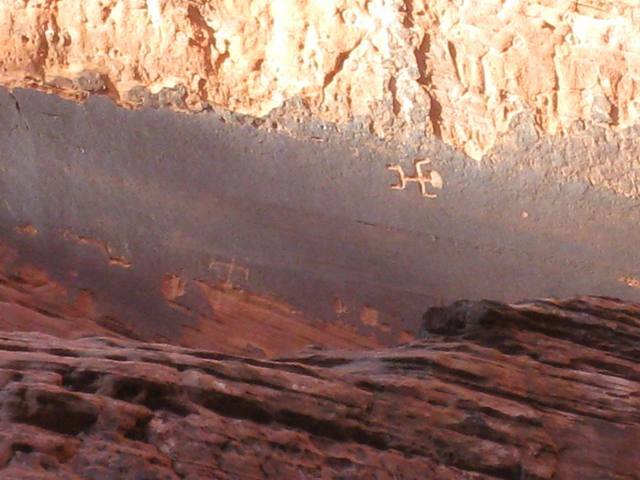 The first of many petroglyphs from the Anazazi indians we would see was here marking the route. It is called falling man for obvious reasons. 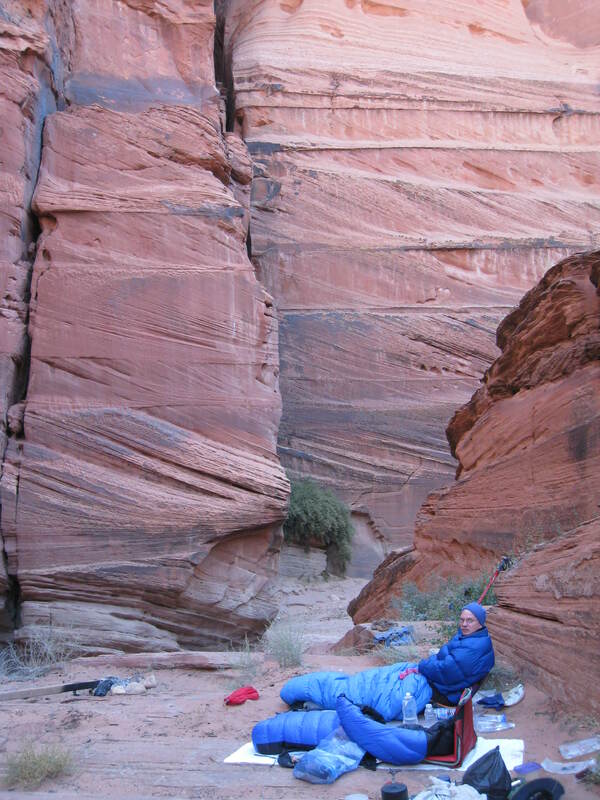 We camped on a rock shelf 10-15 feet above the wash. The morning greeted us with 33 degrees the coldest night of the trip. 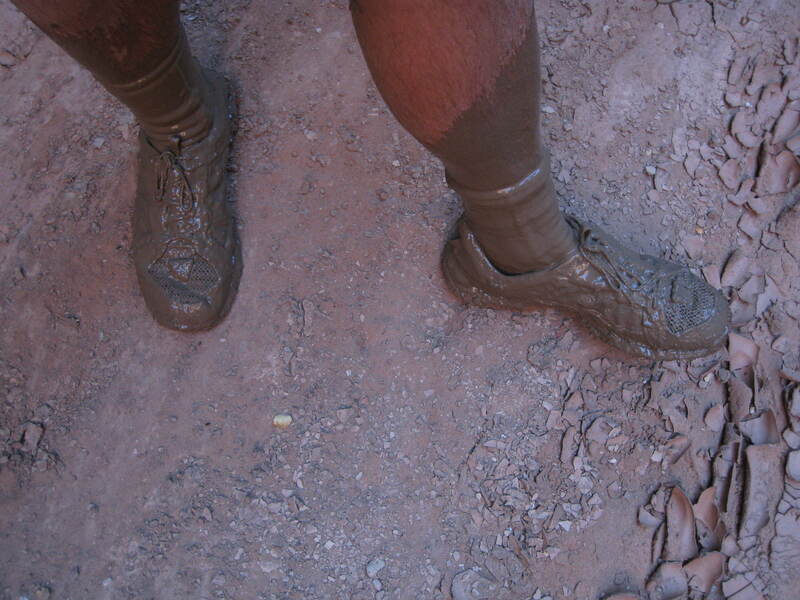 Putting on cold, stiff, muddy shoes was a pleasure as was the first experience with pooping in a bag. The second morning lower Buckskin widened just a bit but the walls got higher. 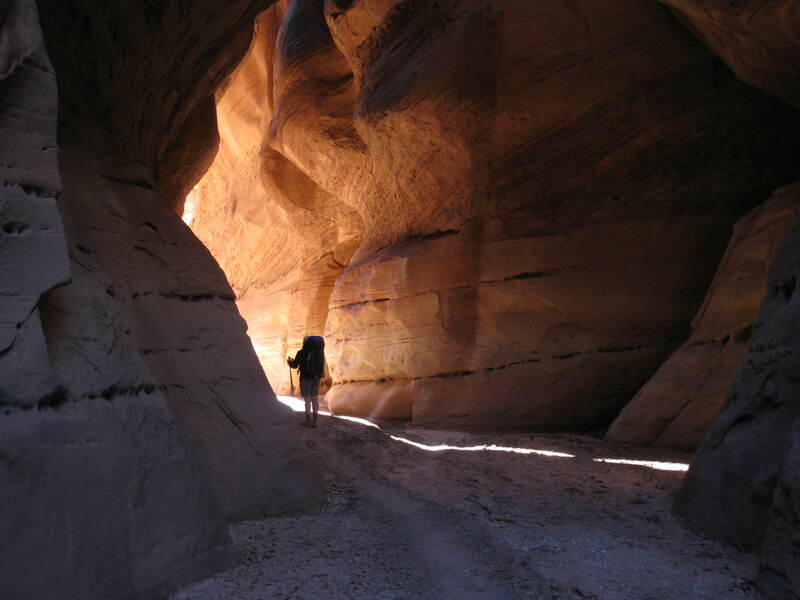 We both thought that this was the best part of Buckskin Gulch, with more amazing carving and light and a few more open places. Only two muddy pools in this section and then the next major obstacle, the Rockfall. About a mile and a half from the end of Buckskin is an area with huge boulders blocking the way. Multiple ways down but all require a rope assist to get down the 15 foot drops. Took a while to choose our way down but decided to use the one with some foot and hand holds chipped into the rock. 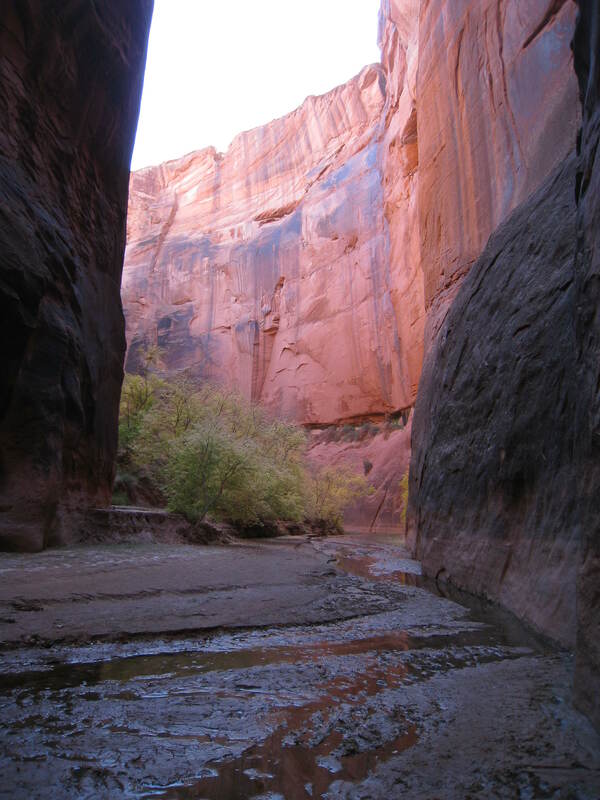 From here on to the confluence with the Paria river the walls soar to 500 feet and just before the end it opens just a bit with a few campsites up on high sand benches. 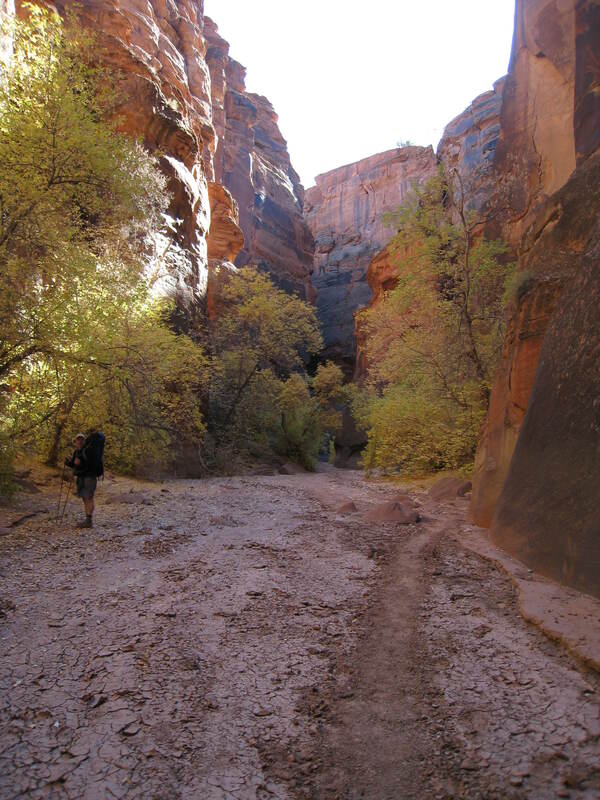 The reported deep and satanic mud was apparent but we avoided it by walking down the narrow stream of water now flowing in the bottom of the canyon. 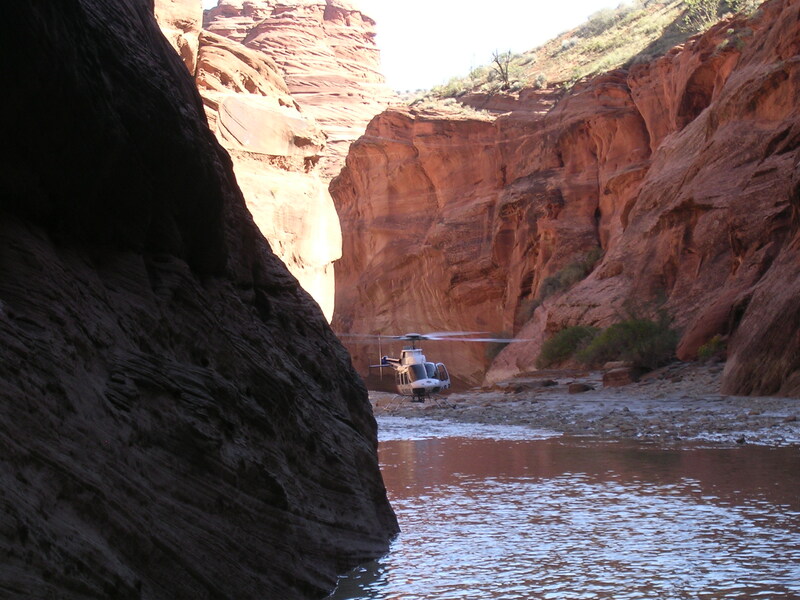 If you were coming down the Paria river you could easily walk by the mouth of Buckskin Gulch and people do. 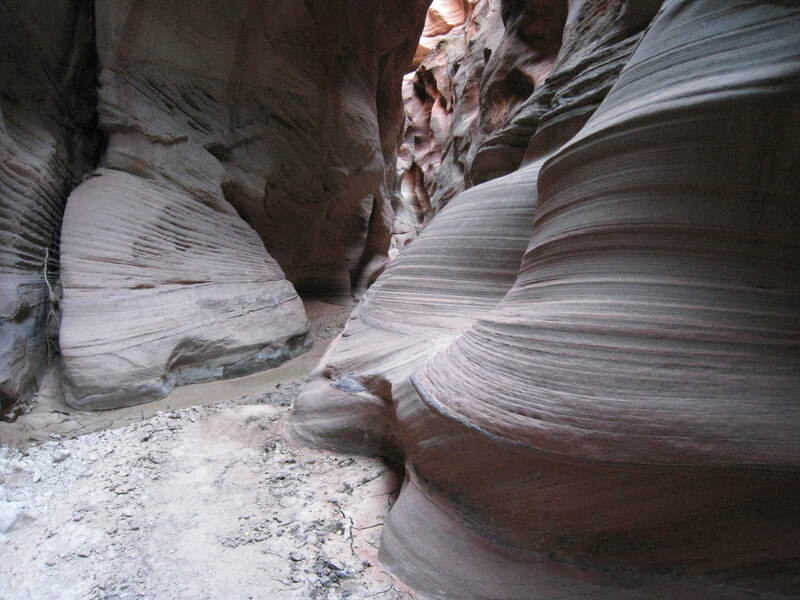 The narrow entrance to Buckskin is straight ahead and the Paria flows from right to left. 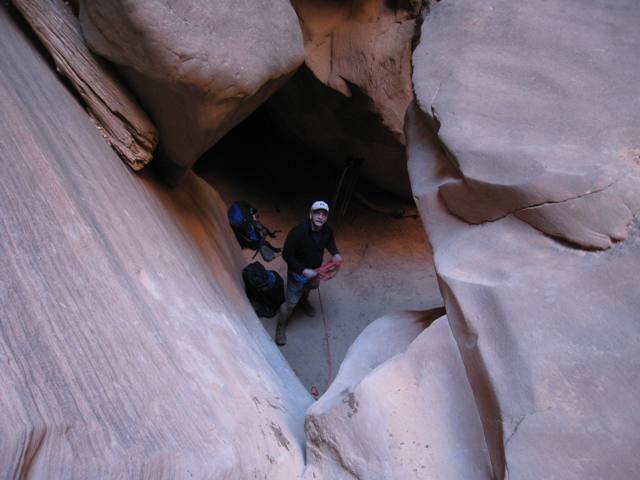 This entry was posted in Southern Utah and tagged buckskin gulch, paria river, scott, southern utah. Bookmark the permalink.